Special news compiled by the US-BELARUS OBSERVER on events in Belarus celebrating the 71st anniversary of World War II victory. Victory Day is a holiday that commemorates the surrender of Nazi Germany to the Allied Forces at the end of World War II. It was first inaugurated in the 15 republics of the Soviet Union, following the signing of the unconditional surrender document late in the evening on May 8th 1945 (after midnight, thus on 9 May Moscow Time). The Soviet government announced the victory early on May 9th after the signing ceremony in Berlin. Belarus has officially recognized Victory Day since its independence in 1991. Victory Day is a special day for Belarus, as the country suffered from Nazi invasion more than any other country. Every third person was killed. This year’s celebration marked the 71st anniversary of Victory Day. In every Belarusian family, there was someone who died as a result of Nazi occupation of Belarus. During Victory Day, Belarusians remember their lost loved ones with tears in their eyes and raised glasses in their hands. Many ask why Belarus, such a small, quiet nation, was attacked so viciously. The reason is because Belarusians possess a spirit of justice and they did not just simply accept military occupation in their land, but fought against their invaders. The first offensive attack of the Soviet Union by the Nazi army took place at the border of Belarus. Though outnumbered, Belarusians opposed the violence, went into the forests and created armed resistance groups, in order to kill Nazis and their accomplices. The Belarusian spirit of human dignity, with an unwillingness to obey evil, helped Belarus endure all of its suffering during the war. Undoubtedly, Victory Day is one of the biggest national holidays for Belarusians. There were many pre-festive events held throughout Belarus during the prior week. Billboards appeared on the streets of Minsk, the capital of Belarus, where famous Belarusians discussed their grandfathers and great-grandfathers, who defended their native land. The flash mob Flowers of the Great Victory started in Trostenets, one of the most tragic places in the memory of every Belarusian. During the war, more than 200 thousand people were killed in this location. In Minsk, there were also museum exhibits and theatrical performances accompanied by military songs in modern arrangements. In some cities, there was a traditional contest where schoolchildren sang victory songs to veterans. This is Victory Day/ With the smell of gun- powder/This is a holiday/With the graying of hair./This is joy/With tears in our eyes./Hi, moms, we did not all come back…/If only to run along the dew barefoot!/Half of Europe marched, crawled –/This day we hastened as we could. In the Minsk region, a reenactment of the Battle for Berlin took place on the eve of May 9th, which became the final point of the terrible war. 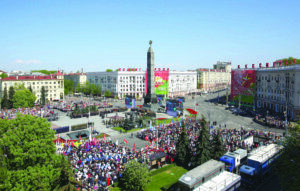 The Immortal Regiment march occurred in Minsk for the first time, debuting in the morning of May 9th. 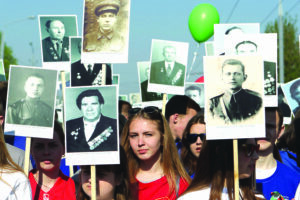 The march, also referred to as Belarus Remembers, consisted of people holding portraits of their relatives who died during World War II and walking through Independence Avenue and adjacent streets, towards Victory Square. Even children told stories of their unknown great-grandfathers who never returned from war, describing them as heroes, in what was an extremely moving tribute. The strong national spirit was passed along to the younger generation from the older generation. During the Victory Day celebrations in Belarus, this wonderful, national spirit of unity could be seen in the eyes of the new generation, as they commemorated those lost and celebrated their continued survival as a people and a nation. 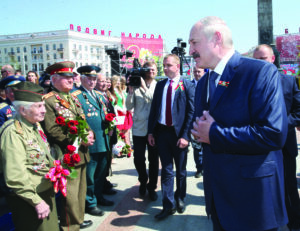 Belarusian President Alexander Lukashenko congratulated the veterans on Victory Day: “I would like to heartily congratulate you on the anniversary and thank you for everything”. He invited the veterans to at- tend the celebratory concert in the evening. The President also took part in the day-time festivities on May 9th, laying a wreath at the Victory Monument in Minsk. Wreaths were also laid on behalf of central government agencies, public associations, the diplomatic corps, the Belarusian Orthodox Church and the Roman Catholic Church. Participants of the ceremony honored the memory of countless victims of World War II with a minute of silence. In addition to this, six volleys of artillery salute were fired in Victory Square. In an endeavor to preserve the memory of World War II veterans for future generations, the Belarusian company Wargaming has created a unique video called War Knows No Nation aligned with Victory Day celebrations this year. The video has been released as part of the global initiative Remember Everything and features veterans sharing their memories from nations including the U.S. and Belarus. The interactive project gives viewers a close-up look at World War II events using a 360-degree view technology. The video is a combination of live panoramic footage and computer-generated imagery. Its approach is unique as far as historical projects are concerned. The Remember Everything initiative was launched in 2013 in a bid to help military history museums all over the world to preserve and restore legendary fighting vehicles. The campaign is designed to revive interest in history, inspire young people to learn more about their country’s past and preserve unique historical artifacts for future generations. The video’s plot is based on memories of the veterans who took part in combat actions during World War II. Viewers are invited to go to war together with the main characters and feel the environment to the extreme by watching the events un- fold from the point of view of combatants and eyewitnesses. A multitude of authentic details have been utilized to beef up the participation effect ranging from war- time costumes to real armored fighting vehicles. The video crew shot the film in Belarus, Russia, the UK, and the USA. The interactive video features three veteran tankers, including one from Belarus and one from the United States. Each has his own story to tell. Alexander Fen (Belarus) is a retired major general who served in the 84th and 31st Independent Tank Brigades. At the age of 19, he took part in the battle of Stalingrad and fought for liberation. The war ended for him in the Polish city of Gdynia. Tom Sator (USA) served in the 4th Armored Division of the U.S. Army. He took part in battles in Belgium, Germany and Czechoslovakia. The War Knows No Nation video is available on YouTube.